Tonight Jessica Mashburn is a DJ, posted in the raised corner of the lounge at Print Works Bistro while a genuine disco ball throws raindrops of light across the walls. The regulars show precisely at 10 p.m. to this pop-up dance party; 45 minutes in, they’re keeping three bartenders and a cocktail waitress hopping with complicated drink orders as dancers fight for space on the floor before the DJ stand. By 11 p.m., the first conga line snakes past the wait station and through the lounge. “Happy anniversary, Crystal and Jeff!” she shouts through the mic. The party ends at 1 a.m., so Mashburn’s taking them up a steep curve with some classic disco and a little Bollywood before dropping “Despacito,” Luis Fonsi’s slow-burn dancehall grind with Damn Yankee — the version without Justin Bieber. The number incites vigorous activity on the dance floor, where sweat and hormones are starting to flow. “[This song] will be requested four or five more times tonight,” Mashburn says as an aside to a reporter. And then it’s “Dancing Queen,” by Abba, and women take turns standing on the raised platform in front of her DJ stand, dancing to the appreciative crowd. See that girl. Watch that scene. Dig the dancing queen. “Abba-dabba do it!” Mashburn implores from her perch. She’s forsaken her usual headgear tonight — a collection of hats, headdresses and fascinators that take up an entire wall of the bedroom she’s appropriated into a costume closet — her hair now in low pigtails and a pair of oversize, pink-tinted glasses that wouldn’t look out of place resting on the nose of Elton John. She’s bouncing and sliding, pumping and rolling her arms so enthusiastically it looks like she might be sneaking in a workout. The night wears on as a soft, coppery rain falls on the fancy cars in the parking lot and a patron hustles outside to put the top up on his convertible. 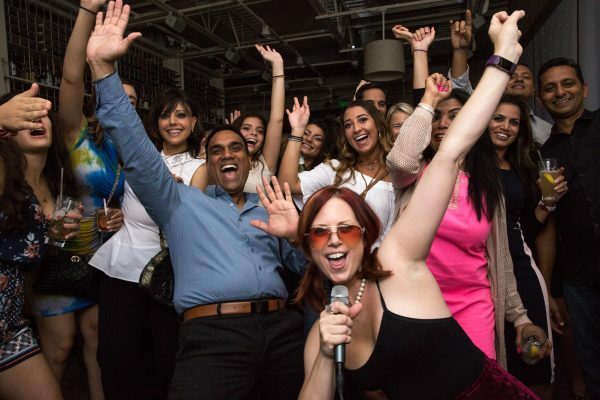 The demographic swirls with young professionals, empty-nest scenesters and veteran club-hoppers, not too young and not too old, with nowhere else to go on a Friday night. “There’s not a lot of classy places in town to go dancing,” Mashburn says. Where craft beer, tattoos and local bands are the cultural mainstream, the pop-up dance crowd in Greensboro is a genuine subculture. She identified and built this scene through hustle and drive, landing it at Print Works, whose parent company, Quaintance-Weaver Mashburn has been associated with since she used to wait tables at the Green Valley Grill more than a decade ago. Now she regularly works wedding receptions here at the Proximity Hotel and the O. Henry Hotel, both as a DJ and performer, and programs all the music for other QW properties. And then there’s this pop-up dance party, a way to make the party public. It’s got the feel of a great wedding reception, a country-club social, the nightclub of a high-end cruise ship, a high-school reunion afterparty. Jessica Mashburn owns it: their diva, their interlocutor, their dancing queen. Upstairs in the Midtown home she shares with fellow performer Evan Olson, across from his studio in the loft, she keeps her finery. 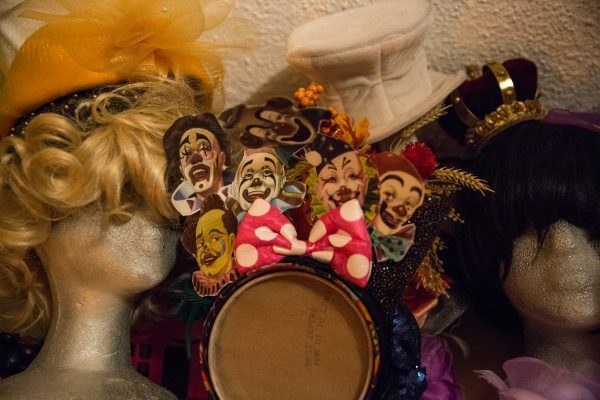 There’s a wall of costumes, every one she’s ever made: a Wonder Woman suit, a Rockford peaches uniform from A League of Their Own, along with patterned dresses and separates in a full rainbow. The top shelf tumbles with headpieces, some she made for High Point Furniture Market with couches and dressers, others for New Year’s Eve, one for the last episode of “TheLate Show with David Letterman,” another with the five Olympic rings. She made one of a literal house of cards, to commemorate both the Netflix show and the precarious nature of our government. And there’s one she made just last month, the “Spy-crowave,” a shot at the Russia scandal enveloping the Trump White House. There are pillboxes and sun hats, boas and beads, masks, tiaras, false flowers for her hair, wigs, a cascade of party shoes. Brooches, scarves, wraps, medallions, colors that mimic the brightly colored houses in certain Caribbean neighborhoods. It’s difficult to tell if the wardrobe is part of her act, or if her act is an extension of the wardrobe. Mashburn dresses to suit the gig. She plays the chanteuse when she works with Dave Fox’s jazz trio, provides a colorful counterpoint to Olson’s minimalist fashion sense in their AM rOdeO sets, goes full-on Mardi Gras when she’s alone behind the piano. When she sang “America the Beautiful” and the National Anthem before a Grasshoppers game in May, she wore a stylish blue jacket and a short, full, blue houndstooth skirt. When she performed her original piece about repealing HB 2 onstage at Birdland in New York City, she wore a little black dress belted in red with a matching red cardigan. And a swan on her head. She was born to do this, whatever this is. Mashburn’s parents are bluegrass musicians whose friends filled her childhood home in Greensboro with that high, lonesome sound. Her father played bass for the Carter Brothers. Her mother was one of the first organizers of Merlefest. They taught her to play piano, and from there she ascended through the the Music Academy of North Carolina in Greensboro before completing her education at Sandhills Community College in Pinehurst, NC, with a brief stopover at UNCG. When she was still a student at Southeast Guilford High School, she used to watch her mother spin records at Bench Tavern. Somewhere along the line she learned to tap dance, work a room, write a song and make a hat. Now she sings and plays guitar, piano and a little bit of mandolin; she could probably do a serviceable job on a drum kit, if you put her behind one. She’s got an accordion she’s trying to wrangle a nice sound out of, and a violin she’s been trying to play, she says, her whole life. The result is a weird mix between Lady Gaga and Shirley Temple, David Bowie and Liza Minelli, Nancy Sinatra and the New York Dolls. And if she can’t find a stage for it, she will make it happen. 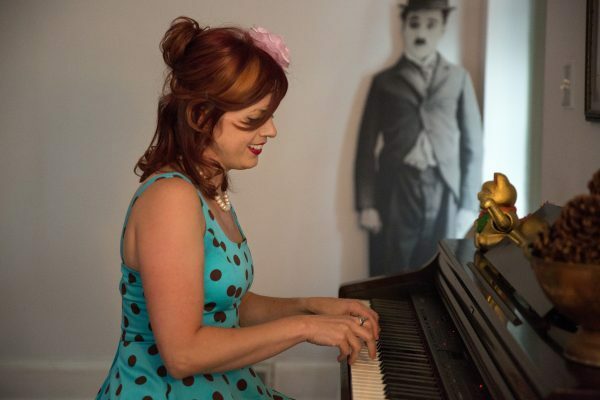 She plays the solo shows on piano and in the duo with Olson, and holds down vocals with a jazz combo. She takes the wedding gigs as DJ and master of ceremonies, and as an officiant can even consecrate a marriage. She pops onstage at Birdland like a seasoned pro and will even play your birthday party if she can fit it into her schedule. She’s been asked to take part in stage musicals, but she can never find the time. She’s booked 16 gigs just this month, between the regular Tuesday night AM rOdeO gigs at Print Works, semi-regular slots in the lobby lounge at the Grandover Resort, private events at the Greensboro Country Club and the Wyndham Tournament and a one-off at the Greensboro Public Library for the One City/One Book Fashion Show & Dance Party. It’s the night before the pop-up, and though she’s got no gigs on the calendar there is still work to be done. Tonight Mashburn is a songwriter, sitting at the piano in her living room while late-afternoon sun streams through the windows. The day’s news saw the announcement of Special Investigator Robert Mueller’s grand jury, which has been hearing evidence about possible collusion between the Trump administration and Russia. Mashburn’s no fan of the president or his party — she and Olson have a short catalog of political material, though it’s more the Smothers Brothers variety than Phil Ochs. She uses social media, too, to make her opinions heard. Some of it finds its way into her act, always tempered with humor. She rhymes Trump with, “What a dump,” works “Katrina” in there to resolve the “subpoena” issue and casts a verse that glances off the infamous “Pee Pee Tape” and OJ Simpson. Mashburn says she left UNCG’s music program because it relied so much on classical training and performance, while at Sandhills she could concentrate on music theory. She started performing right away, eventually landing slots with UBU out of Jamestown and Billy Scott & the Prophets, two regionally touring bands that brought her from southern Florida to Atlantic City, NJ. Tonight’s a rare night off from the stage — she gigged with Olson last night and the pop-up isn’t until tomorrow. There’s a DJ slot in two nights at a private party in Summerfield, and then it’s back on the grind by Wednesday. Maybe the Mueller piece will be ready by then. The song needs some work, but she’s already got the perfect hat.